Jean-Philippe Rameau (French pronunciation: [ʒɑ̃filip ʁaˈmo]; September 25, 1683, Dijon – September 12, 1764) was one of the most important French composers and music theorists of the Baroque era. He replaced Jean-Baptiste Lully as the dominant composer of French opera and is also considered the leading French composer for the harpsichord of his time, alongside François Couperin. Little is known about Rameau's early years, and it was not until the 1720s that he won fame as a major theorist of music with his Treatise on Harmony (1722). He was almost 50 before he embarked on the operatic career on which his reputation chiefly rests. His debut, Hippolyte et Aricie (1733), caused a great stir and was fiercely attacked for its revolutionary use of harmony by the supporters of Lully's style of music. 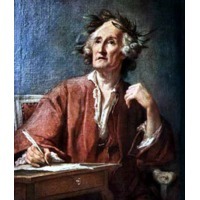 Nevertheless, Rameau's pre-eminence in the field of French opera was soon acknowledged, and he was later attacked as an "establishment" composer by those who favoured Italian opera during the controversy known as the Querelle des Bouffons in the 1750s. Rameau's music had gone out of fashion by the end of the 18th century, and it was not until the 20th that serious efforts were made to revive it. Today, he enjoys renewed appreciation with performances and recordings of his music ever more frequent.